The Locanda was devoted to the short journeys and meditation periods of the priests. In 1937 the priest, sold the locanda for 17.000 lira , today a ridiculous sum of money , but for this period a quite large amount . Elena and Ernesto Peroni became the new owners of this property. Their son Alessandro, tripping around the world learned a lot by working on cruise, later he came back to Argegno, married Giuseppina Bianchi and together they opened and restaurant and bar in Argegno (Actually Albergo Argegno ) , on the lake of Como. In the following years they will give birth to Celestina , Paolo , Alberto and Elena , whom will grow up among restaurant tables and pans and later will help their father Alessandro in the locanda’s gestion. IN 1998, the family decided to refurbish completely the locanda , but at the same time trying to keep the original and characteristic features of the property. They also added all the amenities important for modern time and obtained a three star level. 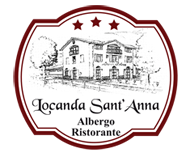 After one year of hard work , they finally inaugurated the new Locanda Sant’Anna on 13 August 1999.